- Use "frac()" or "fmod()" to prevent Time variables from becoming too large. - Use "Float" types only, for higher precision. I've read that android/mobile will convert those variables into less precise "half" or "fixed" types, so that doesn't make sense to me. But, it does seem to help. The textures are not crisp, but the pixelation is negligible from a short distance. 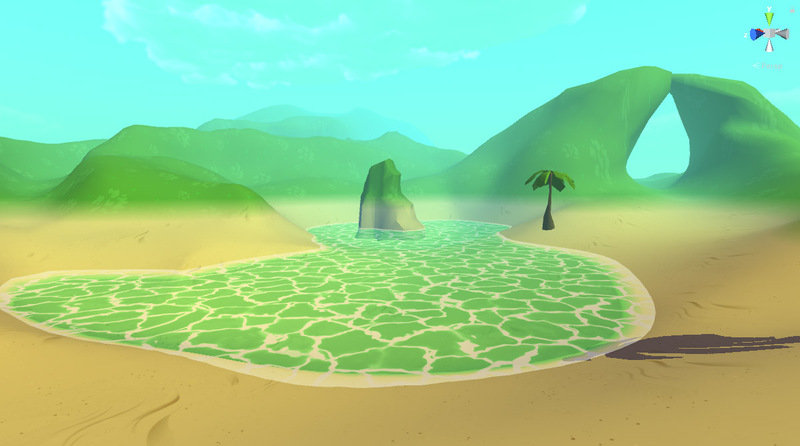 I also added another Alpha property, which blends the main texture with the water color/alpha! I'm not sure if I'll attach my other effects to this yet. Its mostly intended for mobile... so, I think I'm going to keep this version clean and simple. And, I also created a different shader for the terrain/objects. Instead of a "texture-to-fog", its a "texture-to-texture" shader, which has one texture for dirt and one texture for grass that are blended together at a specified height.